August 18,2009, A group of pilots meet each morning for coffee at a central location and tried to think something up as a team one day a week without embarrassing themselves or getting into trouble. An introduction to their little group, Reece, who operates a Mitsubishi recurrency school; Paul, who runs a flight school and teaches the CIRRUS; Ken, an emergency room doctor; Bob, a retired executive from Firestone and an ex-172 jockey; Max, a retired pilot since 1982 who has kept his sense of humor; and Jim a FAA volunteer in the Safety Program. After thinking over everything and everyone, they finally came to rest on the nicest Flight Instructor/FAA Examiner/Pilot in their area. They then discussed all the nice things they knew about her. They actually started with all the bad things they knew or had heard about her, and since they couldn’t think of anything they soon moved on. They knew that she is the most decorated instructor in the entire nation, certificated since 1947 (hundreds of awards including induction in the Tennessee Aviation Hall of Fame in 2002), had the most students as an instructor or examiner of anyone (over 5,000), had flown the most hours of anyone (way over 50,000), and she still has the respect and admiration of the entire aviation community, which numbers about a million or so aviators. The great thing was that all of them had had a connection of some sort with her over the years. They had taken check rides with her, sent students to her, attended some of the awards ceremonies, had her speak at one of their many seminars, or just enjoyed hearing the many funny stories that have occurred during her long career in aviation. They also knew that she had a birthday coming up in November, and not just any old birthday but quite a milestone, her 100th. 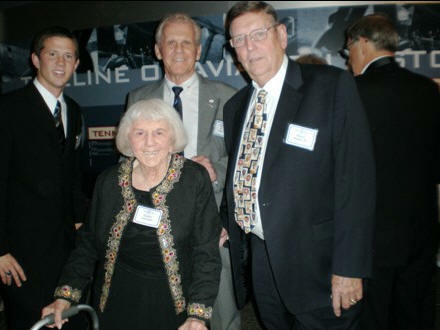 The Tennessee Aviation Hall of Fame Museum is planning a big get-together for her on that date to celebrate not only her landmark birthday but her many contributions to the aviation industry. They didn’t want to crash and lose what little dignity they had left, or take a chance on losing their jobs as pilots to boot, but they decided to visit her on their own at the airport she still operates at the age of 99. They called ahead and found that she is at work by 0700, 5 days a week (down from 7 days a week before suffering the loss of a leg in an accident and since her vision had worsened). So they jumped in Reece’s Mitsubishi and off they went on a bright shiny morning in August on a 30 minute flight with good weather at 15,000 feet. When they arrived, she seemed happy to see them and they spent an enjoyable hour or so as she told some stories on most of them that are best forgotten but unfortunately true. They all bought her book, MAMA BIRD, and she graciously autographed them and wrote something nice in each book. It was a day very well spent, revisiting an old friend, spending half a day with friends and fellow pilots, and flying over beautiful Tennessee in a terrific airplane. They didn’t think it gets any better than that. Have I kept you in suspense long enough for the identity of the birthday girl? Or did you guess it right away? Well you should have known it! Ms. Evelyn Bryan Johnson is turning 100 on November 4th, 2009. You can always visit her at Moore-Murrell Airport (MOR) Monday through Friday. The group of pilots admiration for this fine lady grows with every meeting, and they wish her the very best forever. Happy 100th Birthday, Ms. Evelyn! And thank you for the part you have played in making the aviation industry great.